Description: In a recent assessment of the performance of different absorptive coatings as compact cryogenic infrared calibration targets, Acktar Fractal Black products exhibited lower diffuse and specular reflectance over a range of frequencies. Two variants of Acktar Fractal Black light absorbing coating were tested alongside Aeroglaze Z306 paint and 2850 FT epoxy. The light sources included NIR, mid IR and far IR sources that were passed through a matrix of beam splitters. This setup produced discrete spectral data for various frequency ranges that subsequently allowed us to measure reflectance from the samples with an integrating sphere. The target substrates were comprised of a conductive, 6061-T6 aluminum alloy whose surface had been formed into pyramids separated by grooves to aid spectral characterization. 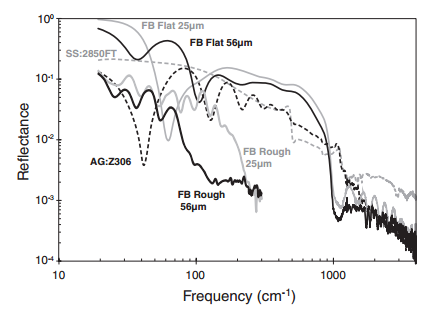 Detailed analysis of the test results revealed that the spectral reflectance demonstrated by Acktar FB optical black coatings was reduced by a factor of 50 compared to flat samples. Furthermore, the Acktar sample targets held up to multiple cooling cycles that dipped as low as 4K, and we recommend the optical black setup as a standard for stray light sensitive NIR work in general laboratories. These results also bode well for Acktar Fractal Black’s potential use in optical light absorbing coating products for the aerospace and astronomical industries, where stray light can be a major source of concern.